Full Fact, the independent fact-checking organisation, check the claims made by Nick Clegg and Nigel Farage during the second round of the Leaders' Debate, hosted by the BBC. Welcome to Full Fact's live factcheck for the Independent of tonight's debate on the UK's membership of the EU. If you hear a claim from either Nick Clegg or Nigel Farage that you'd like us to check, then you can send us a tweet. Mr Farage also says that the UK can't make its own trade deals because of its membership of the EU. Trade is an "exclusive competence" of the EU, which means it does make trade deals on behalf of member states. 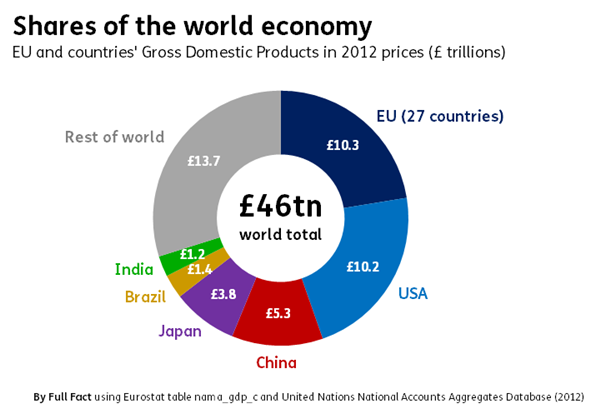 Nick Clegg says the EU is the World's largest economy. He's correct, but only if you treat the 27 nations of the EU as a single 'economy'. 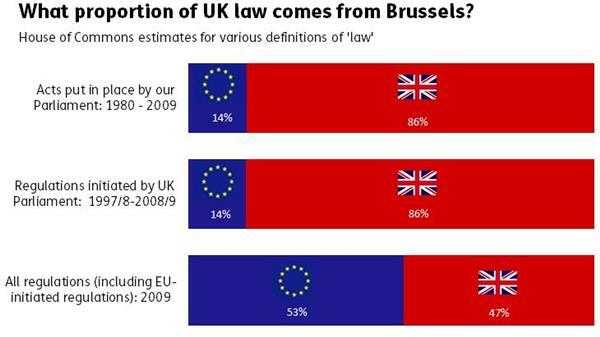 For more details about the proportion of UK law made in Brussels, see our fact sheet. Nick Clegg also referred to Nigel Farage's claim at last week's debate that 485m people could come to the UK. We asked UKIP for their source, but haven't heard back yet. Mr Farage and Mr Clegg also disagree on whether or not there are 29 million Romanians and Bulgarians who could move to these shores. As we've seen, the figures suggest that there are indeed 29 million Romanians and Bulgarians, but they're not all in Romania and Bulgaria: they're spread out across different EU countries. Nick Clegg says that 90% of the change in employment is accounted for by Brits. It's encouraging to see that he's avoided making the same mistake as last week, where he said '9 out of 10 new jobs' went to UK nationals. As we've seen, this isn't quite correct. We've tracked down the claim, which comes from a survey of members of the Society of Motor Manufacturers & Traders (SMMT), published today. Members were asked what would be best for their business if a referendum on the UK’s continued membership of the EU was held tomorrow. 58% said the best outcome was to stay in, and 34% said it would be to ‘stay in with reform’. That is the 92% Mr Clegg is referring to. Nigel Farage says that as a member of the EU, we're not able to have our own immigration policy. The EU creates a great deal of freedom when it comes to the free movement of its citizens, but it's not 'total' freedom; there are still some restrictions. The EU's free movement Directive is what allows people to travel between EU countries without needing a visa and stay there for up to three months. After that, though, people have to meet certain conditions if they want to stay in another country (e.g. having a job or being a relative of someone with a job). The single market provides for free movement of goods, services and 'capital' (investments, loans etc), although goods that pose public health risks are still regulated and member states can still treat non-residents differently for tax purposes. 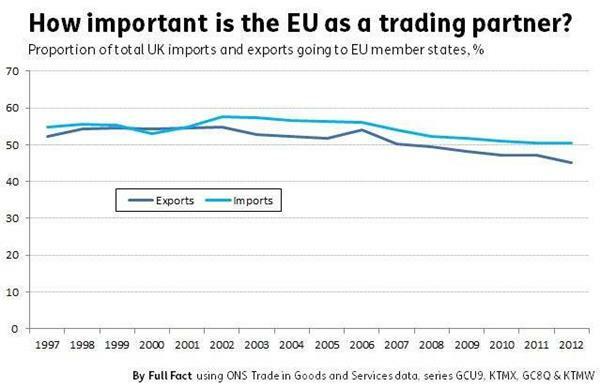 On Twitter @Kavmeister asks what proportion of UK trade is with the EU? Around half of our imports and exports are with EU nations. However these figures are contentious, as some claim that after reaching the EU these goods will be resold to consumers in other countries (the so-called "Rotterdam Effect").